I made a little game for fun, and to practice my C# skills. What better way to have fun with C# than with Unity3d? This game is called Mantle Moon Sea, and the idea of the game is that you are piloting Bob the Hamster’s submarine through the ice-caves of a frozen moon. You collect treasure, bump into harmless jellyfish, explore maze-like caves, and generally have a relaxed time. Oh, and you also pump the pristine ocean full of floating science buoys. The music is Bilinsky by rocavaco (CC-BY), and my oldest daughter made all the jellyfish noises for me. 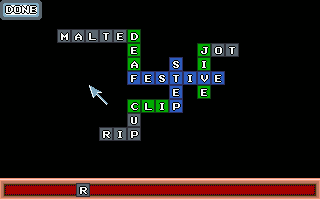 Last week I finished a new game for the 2012 Week Long OHR Random Collab Contest. This was a collaboration, and my randomly chosen team-mate was Sid “Thespazztikone” Tyler. He happens to be a master at making maptiles, which is one of my biggest weakpoints, so I was very happy to be teamed with him, and he didn’t seem too mad about me hogging all the plotscripting and textbox-writing fun. 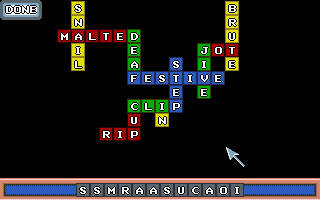 The game is intended to be in the style of a point-and-click puzzle-adventure, although there is no pointing and clicking. All the controls are the standard OHRRPGCE interface for running around the map and fighting RPG battles. The puzzles are all built into the battles, requiring you to use the correct sequence of commands to win. 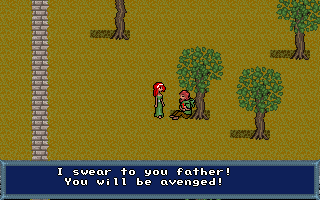 I tried to make the dialog funny, and based on reactions I have gotten to it so far, I think I succeeded. 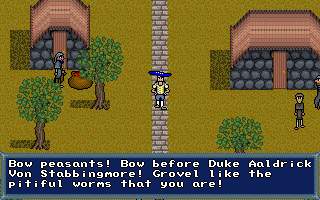 The game uses tall hero walkabouts, based on the WalkTall tech demo scripts that I wrote a few months back. In writing this game I found a fixed a few bugs with the OHR’s support for modifying walkabout sprite slices. 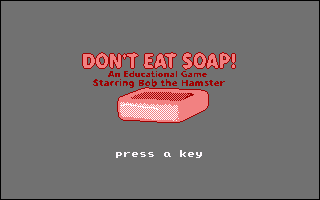 I am please to announce that an updated version of Don’t Eat Soap has been released for the OUYA Console. This new version features 15 new levels (for a total of 40 levels) and 3 new enemies. There are also an assortment of small bugfixes and tiny improvements. Now you can not eat soap in even more style than before! Remember! This is only a game! Do not try it at home! This game is also available on the OUYA console! The source code is written using python and pygame. 2008-11-24: Updated! Check out new features such as author portraits, difficulty levels, and visualization of missed letters. 2011-08-17: Updated! 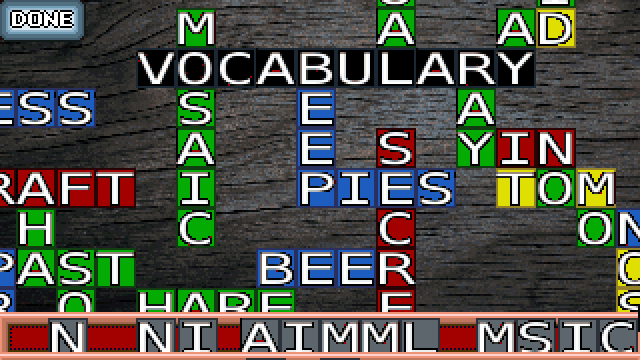 Added an Android version. Removed the flakey picsearch feature, and replace it with additional joyous kittens! Provide Excellent Customer Service through SMASHING! I recently ported some of my ancient QuickBasic code to FreeBasic. One such piece of code was an old unfinished prototype of a Bob the Hamster jump-and-run side scrolling game. You can move Bob around a single level, and interact with a few objects, although there are no enemies to fight. 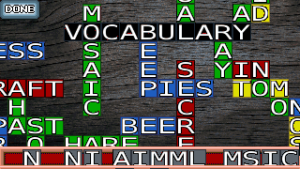 This code is notable in O.H.R.RPG.C.E history because, as best as I can remember, it is the first Hamster Republic code to use the multi-directional scrolling code used for the OHRRPGCE’s maps. I usually like to post here about art, and that art is usually in the form of drawings. But I also believe in games-as-art. For something crazy like 9 years now, I have been working on a program called the OHRRPGCE which lets you make your own game with minimal programming knowledge. It is only good for old-school console-style RPG games similar to the NES and Super Nintendo Final Fantasy games– so if you are not into that you won’t be interested– but if you ARE into that, by all means, do play with this new toy. People don’t often thing of game-making as art, and I think that is partly because the tools of the medium are so hard to pick up, let alone to master. You don’t have to be Rembrandt to pick up a paintbrush and slap some paint on a canvas. Most art is very approachable, even if it isn’t easy to do well. Programming games on the other hand requires you to spend hours, days, weeks, even months reading tutorials and manuals before you can even learn and understand enough to blit your first pixel. That is part of why I do this. This is not the same kind of tool the professionals use, but it is a tool that anybody can pick up. Today is a beautiful day. It is a good day for painting things that have been burned. I wonder why fire is not more popular in art. Pyromania is so artsy. I am currently eating potstickers and california rolls, and thinking about how to use perl compatable regular expression rules (regex’s) to guess the appropriate material code and oversize value for a set of human-readable price page filenames. That is the sort of stuff I do at work. Today is a very good day.